I don’t know what it is with me and the color green? I know that the “official” colors of Halloween are black and orange, but I can’t seem to create any recipes that are not green! 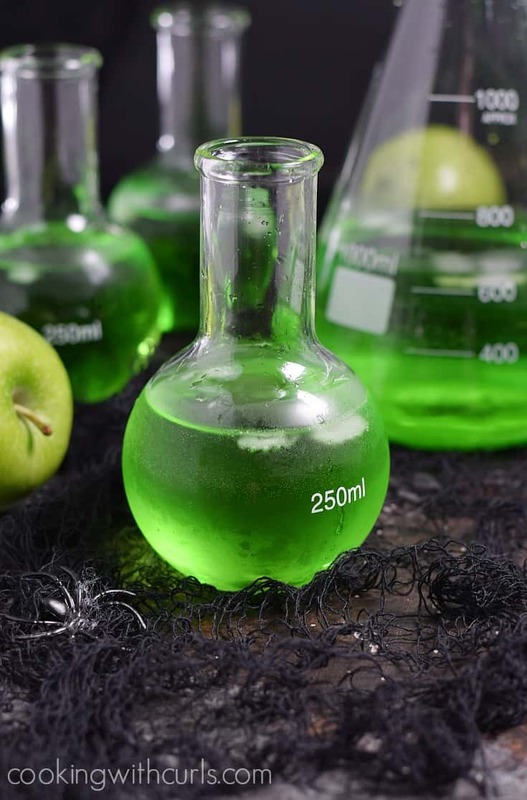 Technically, witches are green…and so are Frankenstein and toxic waste. Or maybe it’s just because green is one of my favorite colors. 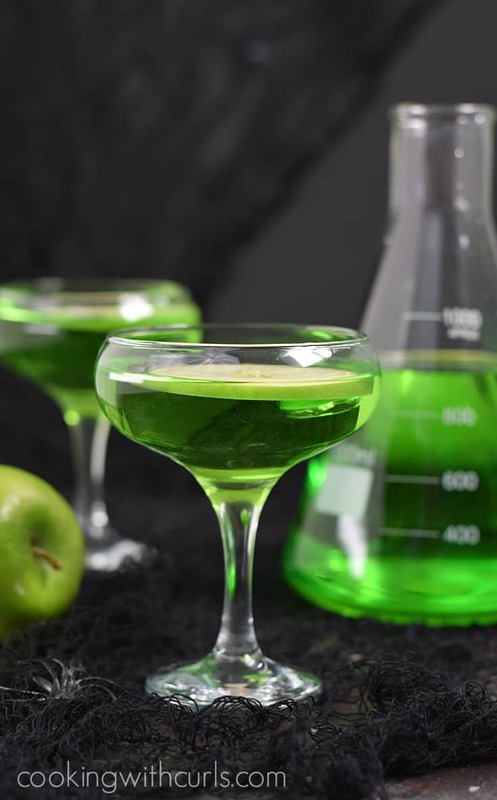 Whatever the reason may be, this Poisoned Apple Cocktail…..
is a gorgeous shade of green, lol. They are a bit tart, have a slight kick, and then some fun bubbles to lighten them up. This is not a sweet cocktail, it is definitely more tart than sweet. This content may include some affiliate links. I also realized that not everyone is going to buy these cute little ball flask science experiment glasses just to make this drink. Apparently I am the only person crazy enough to do that. 😉 So I decided to show the cocktail in two different ways and make it a year round drink, maybe? I vote yes! I bought my glass beaker at Michael’s, but if they are sold out you can find it here on Amazon. If not, a glass pitcher will work just fine. Can you tell how excited I am about Halloween? As with most cocktail recipes, you simply pour all of the ingredients into a pitcher and stir to combine. The actual serving amount will vary by the size of your glasses, but 4 to 6 seemed like a good guess. I used Pearl Apple Pie vodka because that is what I have on hand. Any apple vodka will do. I could buy Pearl Caramel vodka in Iowa, but I can’t find it here in Arizona, so my only option was Stoli Salted Karamel. Again, any caramel vodka will work. When did Stolichnaya switch to Stoli®??? Make sure you chill your vodka and soda before you make your drink. Have some extra sodas on hand in case the cocktail is too strong, simply add more soda to each glass if needed. I added the ice cubes to make bubbles for the pictures, they are optional. 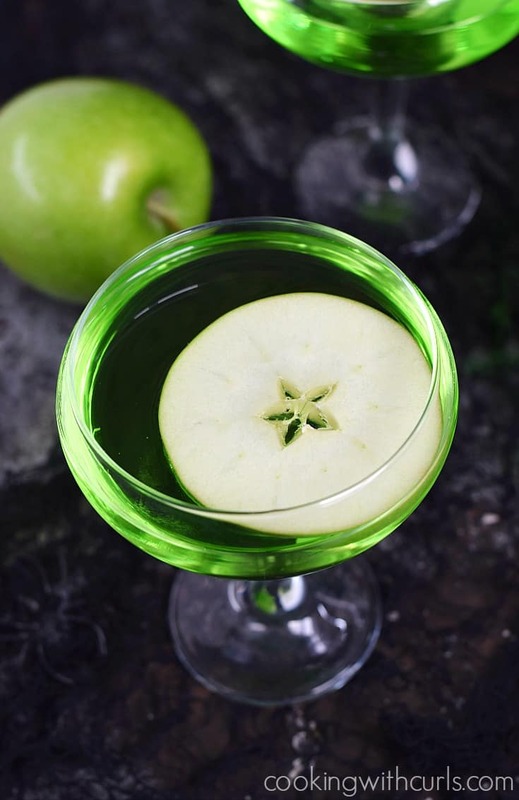 Caramel Apple Martini without gooey caramel sauce. Well I think we have cocktails covered for the Halloween party. 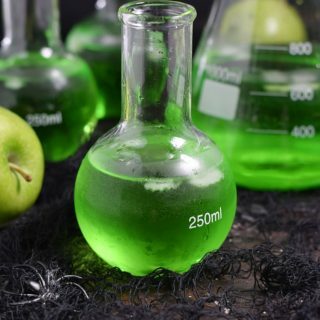 Channel your inner witch this Halloween and serve a delicious Poisoned Apple Cocktail to your guests! Pour all ingredients into a serving pitcher and stir to combine. Pour into glasses and garnish with apple slices if desired. Ice cubes are optional, but they do make the drink bubble. *the amount of servings is just a guess and will depend on the size of your serving glasses. How fun! All of your cocktails always sound so tasty, but this one looks amazing, too! I’ll be featuring it tonight on Best of the Weekend!